Tucked away in a small garden opposite the Yigal Allon Cultural Center, you will find one of the hidden gems of Safed. A museum dedicated to the lost communities of Hungarian Jewry. Jews lived in Hungary for over 1000 years until the community was devastated and destroyed in 1944 during the Holocaust. However, despite this devastation, the Museum is dedicated to the life and times of Jews in pre-war Hungary, as well as to the community's resistance during the Occupation, and focuses very little on the destruction of the community. With everything from a 19C army uniform to handmade lace serviettes there is plenty to see in the display cabinets. There are albums of photographs of community life, audio and videos recordings, a beautiful model of the Dohany Great Synagogue in Budapest and a wide variety of documentation and Judaica. If you have Hungarian Jewish Heritage, or want to do research on the lost Jewish communities of Hungary, the Museum offers plenty of information and guidance from its staff. There are over 600 slides of Hungarian synagogues, and a detailed data base of what happened to individual buildings. There are also thousands of photos of gravestones from all over Hungary. If you can read Hebrew you can check the information about the gravestones on the Museum's database and find out more about your family history. With details being added to the data base all the time, you can also contribute your own information and perhaps track down lost relatives. Apart from increasing its collection of memorabilia and helping researchers, the Museum has recently finished the restoration of the Aron Kodesh (Holy Ark) from a synagogue in Tokaj (Tokai) in Eastern Hungary, which is on display. 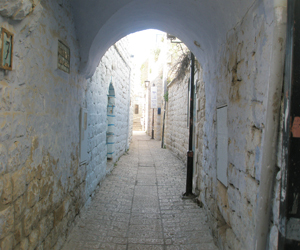 There is an annual conference in Safed, held during Chol Moed Sukkot (the intermediate days of the Sukkot holiday), which gives an opportunity for the older members of the Hungarian community in Israel to get together as well as for the younger generation to learn more about their heritage. One very important visitor, the President of Hungary, specifically asked to see the Museum when he made his State Visit to Israel in March 2008. He was very impressed by the Museum and encouraged the staff to continue in their efforts to preserve the history of Jewish Hungary for future generations. Thousands of visitors come every year to learn more about Hungarian Jewry, and even if you aren't personally connected to the community, the museum gives a moving insight into a lost world. Personal and group tours available in Hebrew, Hungarian and English. Groups are asked to book in advance. The museum is open Sunday to Friday between 9.00am and 1.00pm.